The University of Toronto Scarborough, also known as U of T Scarborough or UTSC, is a satellite campus of the University of Toronto. Based in the Scarborough district of Toronto, Ontario, Canada, the campus is set upon suburban parkland in the residential neighbourhood of Highland Creek. It was established in 1964 as Scarborough College, a constituent college of the Faculty of Arts and Science. The college expanded into a mid-sized university following its designation as an autonomic division of the university in 1972. Academics of the campus are centered on a variety of undergraduate studies in the disciplines of management, arts and sciences, whilst also hosting limited postgraduate research programs. Its neuroscience program was the first to be offered in the nation. The campus is noted for being the university's sole provider of cooperative education programs, as well as the Bachelor of Business Administration degree. Through affiliation with the adjacent Centennial Science and Technology Centre of Centennial College, it also offers enrolment in joint programs. The campus has traditionally held the annual F. B. Watts Memorial Lectures, which has hosted internationally renowned scholars since 1970. Its nuclear magnetic resonance laboratory was the first of its kind in Canada, allowing the campus to conduct influential research in the environmental sciences. The original building of the campus was internationally acclaimed for its architectural design. The Dan Lang Field, home to the baseball team of the Toronto Varsity Blues, is also situated at the campus. The 152-hectare (380-acre) land along the valley of the Highland Creek in Scarborough, Ontario was purchased in 1911 by Toronto-based businessman Miller Lash, who developed the site into his summer estate with a mansion, today known as the Miller Lash House. The mansion included 17 rooms, a barn, a coach house, and three houses for his staff to dwell. Over the following years, over 100 acres of the estate was also used as farmland. Following the death of Miller Lash in 1941, the estate was acquired by E. L. McLean, an insurance broker, in 1944 for $59,000. He made new additions to the estate, including a swimming pool and change room, and a retaining wall made in stone. About 82 hectares (200 acres) of property was later purchased from McLean, just before his death, by the University of Toronto for about $650,000 in 1963, as part of the university's regional expansion. The groundskeeper of the land would continue to reside in the Highland Creek valley for the next 29 years. McLean's additions to the Miller Lash House, which would eventually become the residence of the campus's principal, were modernized and 28 hectares (70 acres) of surrounding land north of the estate were also acquired. The University of Toronto established the Scarborough College as part of the institution's collegiate university system and declared the campus as a branch of the Faculty of Arts and Science. D. C. Williams was appointed as the principal of Scarborough College and the planned Erindale College, as well as vice-president of the university. The college's faculty, consisting of 16 members, was also established and headquartered at the main campus in Downtown Toronto. First classes were held at Birchmount Park Collegiate Institute and Old Biology Building at the St. George campus. Designed by John Andrews, the first building of the campus began construction the following year. Due to delays in construction after a strike among workers, the Scarborough College opened in temporary classes at the main campus to 191 full-time students in 1965. The first building was completed in time for the following academic year. The college included a 6,000-square-foot (560 m2) television production studio. This was for a unique video lecturing system the college was initially planned to have, that relies on the use of closed circuit television for teaching purposes. The system grabbed international media attention, and was complimented in the 1967 edition of Time. However, the video lecturing system was abandoned after it was condemned for the lack of communicability of students with instructors. In 1972, the campus was reorganized as a separately governed division of the university's Faculty of Arts and Science, developing its own curriculum. In 1973, it became the first post-secondary institution to adopt a course credit system in Ontario and the first cooperative education program was established. The campus adopted its present name after being renamed "University of Toronto Scarborough Campus" in 1983 and "University of Toronto at Scarborough" in 1996. The initials UTSC comes from the former name which is still commonly used to refer to the campus today. The University of Toronto Scarborough campus is mid-sized. It sits on 123 hectares (300 acres) of land, forming the west side of the Highland Creek neighbourhood in Scarborough. It is bounded entirely by Morningside Avenue to the west. Its eastern, northern and southern borders are not definite, however; the campus grounds extend north slightly south of Highway 401 and extends south slightly north of Old Kingston Road. Its eastern boundary is Military Trail while south of Ellesmere Road and slightly further east while north of Ellesmere Road. Unlike the university's main campus, the University of Toronto Scarborough is located in a suburban area, consisting of residential houses along its eastern side and urban forestry on its southern and western side. The neighbourhood's namesake river runs through the southern portion of the grounds and its valley consists of pedestrian trails that link the campus to nearby parks and neighbourhoods. Transit bus service by the Toronto Transit Commission, GO Transit, and Durham Region Transit connect the campus to nearby transportation hubs. The Andrews Building, the first completed building of the campus named after its designer, John Andrews, was built in a brutalist architectural style and completed in 1964. The interiors were made to mimic streets of a city, with wide hallways and balconies on upper floors. The building is divided into two wings, known as the Science Wing and the Humanities Wing. The Meeting Place, a large atrium at the center of both wings, is often used to hold events. The design of the Andrews Building, along with its unique closed circuit television teaching system, were targets of international acclaim during the decade. The 1970s and onward saw new buildings being designed in a modernist style. The Recreational Wing was completed in 1972, followed by the Bladen Building which opened the next year and named after Vincent Bladen, former dean of the Faculty of Arts and Science. The Bladen Building housed the University of Toronto Scarborough Library, then known as the Bladen Library. The N'Sheemaehn Child Care Centre, one of the university's non-profit child day care facilities, opened in 1990. An underground corridor completed in 1995, known as the Hall of Excellence, connects the Bladen Building to the Andrews Building. Double cohort brought challenges to the teaching, study and residence spaces at the campus due to increase in first-year enrollment. In response, the Academic Research Centre (ARC) and Joan Foley Hall were constructed. The ARC was built in 2003 as an extension of the Bladen Building with a copper finish. It allowed for the relocation and expansion of the library to its present state and introduced the campus's first 300-seat lecture theatre, which has since held the Watts Lecture series, after formerly being held in the Meeting Place. The Doris McCarthy Gallery, also found in the ARC, exhibits works by local artist and campus alumni, Doris McCarthy. The Student Centre was opened in 2004 through a project that was initiated and funded by students. Constructed using 18 tonnes of recycled steel from a demolished gallery at the Royal Ontario Museum, the three-storey Student Centre earned a Leadership in Energy and Environmental Design (LEED) certification as well as a Green Design Award from the City of Toronto. The Social Sciences Building, home of the Department of Social Sciences, also opened in 2004 as the Management Wing but took its present name after the completion of the Instructional Centre in 2011, which became the new home of the Department of Management, the Department of Computer and Mathematical Sciences, and offices of cooperative education programs. Brick and limestone were used to create the Arts and Administration Building, completed in 2005, which holds the Office of the Registrar and the principal's office. The Science Research Building, where post-graduate research facilities and a lecture hall are located, is an extension of the Science Wing that was completed in 2008. Since 2009, the university has undertaken a proposal to substantially expand the campus north of Ellesmere Road, starting with the construction of the Instructional Centre, funded by Canada's Economic Action Plan, completed in 2011. The Toronto Pan Am Sports Centre (built 2014) was one of the main venues of the 2015 Pan American Games and 2015 Parapan American Games. The Toronto Pan Am Sports Centre brought pool facility to campus and significantly expanded the size of the gym. The Parapan American Games also brought an addition of seven accessible tennis courts to the Highland Creek valley. The Environmental Science and Chemistry Building, completed in summer 2015, was the third building to open in the north grounds. In 2016, the construction of Highland Hall began on the south grounds of the campus, where the former recreation centre was situated. After completion, Highland Hall will house lecture halls, the registrar office, accessibility services and some social science departments. The campus is primarily an undergraduate institution, thus it attracts the most direct-entry applicants from secondary schools among the university's three campuses. The campus has 13 academic departments: the Department of Anthropology, the Department of Arts, Culture and Media, the Department of Biological Sciences, the Department of Computer and Mathematical Sciences, the Department of English, the Department of Historical and Cultural Studies, the Department of Human Geography, the Department of Management, the Department of Philosophy, the Department of Physical & Environmental Sciences, the Department of Political Science, the Department of Psychology and the Department of Sociology. Two extra-departmental units are the French and Linguistics and Centre for Critical Development Studies. Students are diversified among concentrations that are specialist degrees, as well as the common majors and minors. The cooperative education programs, which place students for up to three semesters in workplaces pertaining to their field of study, are unique to the campus in the University of Toronto. Joint programs with Centennial College, that award both a university degree and a college diploma, are offered in journalism, new media, paramedicine, industrial microbiology, and environmental science. Service-learning course is also offered. Ten departments of the campus contain programs that award a Bachelor of Arts degree. The department of Anthropology offers interdisciplinary programs in health studies and on the subject of humanity. At the Department of Arts, Culture and Media, courses in visual and performing arts, new media, and journalism are taught. It is also one of the only two universities in Ontario that grants an undergraduate degree in arts management. The department of English provides study on English literature and film studies. Centre for Critical Development Studies offers both arts and science degree on international development issues. French and Linguistics offers courses in non-English languages, linguistics, and psycholinguistics. Department of Historical and Cultural Studies teaches African studies, classical studies, global Asia studies, history, religion, and women's studies. The department of Human Geography oversees programs in city studies, diaspora studies, physical and human geography. The department of philosophy offer programs in philosophy. Department of Political Science includes programs in political science and public policy. Department of Sociology offers courses in sociology and social science. The university has five departments in the sciences, which award a Bachelor of Science degree. The Department of Biological Sciences offers programs and courses related to the biological and life sciences. The Department of Computer and Mathematical Sciences teaches computer science, mathematics and statistics. The Department of Physical & Environmental Sciences oversees programs in physics, astronomy, environmental sciences and chemistry. The Department of Psychology includes programs in psychology, mental health and neuroscience. The department of Anthropology could also award Bachelor of Science degree, in addition to Bachelor of Arts degree. The Bachelor of Business Administration with co-op option degree is also unique to the campus. It is awarded by the programs in the Department of Management, which offers specialist degrees with fields in marketing, human resources, finances, accounting, information technology and economics. Three graduate programs are based on the campus. The Department of Physical & Environmental Sciences offers masters and doctoral degrees in environmental science. The Department of Psychology offers an MA and PhD combined program in clinical psychology. Prior to the opening of the Student Centre, the University of Toronto Scarborough was one of two university campuses in Canada to not have a student activity centre. Upon opening, it became the home of student life, governance, and culture of the campus. The Student Centre is a three-story 48,000-square-foot (4,500 m2) building, where the office of the Scarborough Campus Students' Union (SCSU), office of Student Affairs of the University of Toronto Scarborough, as well as other offices of student clubs and organizations, are located. It also contains a television lounge, food court, health and wellness centre, and multifaith prayer room. The Rex's Den is a pub and dine-in restaurant located in the first floor of the Student Centre. It was formerly operated as The Bluffs, which opened subsequently after the opening of the Student Centre but re-opened with its present name and improved service in 2009. Student media on the campus include Fusion Radio, the campus's student-run internet radio station, and The Underground, the campus's official student newspaper. The campus also receives distributions of The Varsity. Greek life at University of Toronto Scarborough includes two sororities; Chi Sigma Xi Multicultural Sorority and Delta Alpha Theta - Gamma Chapter. Neither of these organizations have a house. Currently there are no active fraternities at the campus. As per their policy, the University of Toronto does not officially recognize neither fraternities or sororities. Student residence is located primarily in the southern-most part of the campus, consisting mostly of townhouse-style homes and the Student Centre. The first residence area, the Student Village, which was able to accommodate 250 students, was opened in 1973 after pressure from traveling students. The townhouses are split into different halls, each bearing a different type of wood's name, in alphabetical order. These 'Phase 1' houses, the ones originally part of the Student Village, include Aspen, Birch, Cedar, Dogwood, and Elm hall. The next 'Phase 2' halls erected include Fir, Grey Pine, Hickory, and Ironwood hall. 'Phase 3' are the townhouses located north of the main campus, near the Science Research building, include Juniper, Koa, Larch, and Maple Hall. Over 600 people can live in the townhouses. The townhouses feature shared common areas, kitchens, and bathrooms for students. The four-story-high Joan Foley Hall, opened in 2003, is the first apartment-style residence complex on campus, named after the campus's first female principal. It accommodates 230 people. It is a suite-style dorm with shared common areas, kitchens, and bathrooms per unit. The building is equipped with an elevator. It is located in the Southern Residence area. The Student Centre, a white building located next to Joan Foley Hall, is where the administration for the housing is run, and acts as a common area for all residence students.It handles all mail for students, and has some supplies such as garbage bags and light bulbs available for students to use. All housing has both shared and single bedrooms available, as well as housing periods dependent upon semester. Student housing has a 'first-year guarantee' where first-years who apply before a certain deadline are guaranteed to find housing. Noted professors and researchers at the University of Toronto Scarborough include poet Daniel Scott Tysdal, historian and author Modris Eksteins, and Laura-Ann Petitto, a multiple award-winning American cognitive neuroscientist and psychologist who has performed influential research in various branches of neuroscience using humans and chimpanzees. The campus has educated a fair number of noted persons involved in a variety of fields. Politicians include: the 28th and former Lieutenant-Governor of Ontario, David Onley; Member of Parliament for Scarborough–Guildwood John McKay; Member of Provincial Parliament for Scarborough–Guildwood Margarett Best; and former Member of Provincial Parliament Mary Anne Chambers. Sports personalities who graduated from the University of Toronto Scarborough include marathon swimmer Cindy Nicholas, sports broadcaster and former Toronto Maple Leafs General Manager Gord Stellick, and youngest-ever Canadian national cricket team player Ruvindu Gunasekera. Toronto-based artist Doris McCarthy also graduated from the campus. Notable alumni in the field of business include Derrick Fung and Preet Banerjee. ^ Campbell, Don (2014-12-12). "Professor Bruce Kidd appointed tenth principal of UTSC". University of Toronto Scarborough. Retrieved 2015-07-03. ^ "Professor William Gough officially named U of T Scarborough vice-principal academic and dean". University of Toronto Scarborough. 2016-06-29. Retrieved 2016-08-18. ^ a b "University of Toronto Facts and Figures". Office of the Vice-President & Principal. 2009. ^ a b c "Quick Facts". University of Toronto. Retrieved 2017-07-04. ^ "City of Toronto By-Law No. 744-2001" (PDF). ^ "University of Toronto. Scarborough Campus. - Discover Archives". discoverarchives.library.utoronto.ca. ^ "News - University of Toronto". www.utoronto.ca. ^ a b "The Underground » UTSC's "Open"-minded Architecture". The-underground.ca. 2010-11-11. Retrieved 2012-04-01. ^ "~ Don't neglect satellite campuses when choosing a school". Globecampus.ca. 2009-11-27. Archived from the original on March 19, 2012. Retrieved 2012-04-01. ^ "Atop the valley". University of Toronto Scarborough. Fall 2014. ^ a b Grant, Kelly (2010-08-27). "University of Toronto's Scarborough campus to get a major makeover". The Globe and Mail. Toronto. ^ "Explore UTSC's story of intriguing architecture at Doors Open Toronto". Webapps.utsc.utoronto.ca. 2010-05-21. Retrieved 2012-04-01. ^ "Double Vision - How U of T coped with the cohort". UofT Magazine. Winter 2004. ^ "Acclaim for UTSC Student Centre Architecture, Design". University of Toronto Scarborough. May 4, 2005. Retrieved 2007-10-09. ^ "Arts and Administration Building, UTSC | Montgomery Sisam Architects". Montgomerysisam.com. Retrieved 2012-04-01. ^ "City of Toronto - Doors Open Toronto". Wx.toronto.ca. Retrieved 2012-04-01. ^ "Science facility will enhance innovation in research". University of Toronto Scarborough Media Release. 28 May 2006. Retrieved 2007-01-22. ^ "Environmental Science and Chemistry Building" (PDF). University of Toronto Scarborough. Retrieved 2015-12-26. ^ "$10 million in renovations at UTSC". 5 October 2015. ^ "Number of first-choice applicants soars at UTSC". University of Toronto Scarborough. Retrieved 2012-04-01. ^ "Academic Departments & programs". University of Toronto Scarborough. ^ "Joint Programs with Centennial College". University of Toronto Scarborough. 2006. Retrieved 2007-12-15. ^ "About Service Learning & Outreach". Centre for Teaching and Learning, University of Toronto Scarborough. ^ "Acclaim for UTSC Student Centre Architecture, Design". Webapps.utsc.utoronto.ca. Retrieved 2012-04-01. ^ "Chi Sigma Xi". www.chisigmaxi.com. Retrieved 2017-07-21. ^ "UTSC History". utsc.utoronto.ca. Retrieved 20 March 2017. ^ "UTSC - Townhouses". utsc.utoronto.ca/~residences. ^ "First New Residence in 11 Years Opens at UTSC". Webapps.utsc.utoronto.ca. 2003-11-11. Retrieved 2012-04-01. ^ "The 2007 Best Lecturer Competition presents The Top 10!". TVOntario. 28 May 2006. Retrieved 2007-01-22. 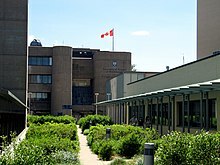 Wikimedia Commons has media related to University of Toronto Scarborough.